The Far Cry series is known for a lot of things. Eccentric villains, lush environments, and disappointing endings all make up the Far Cry identity. One of the series’ most noteworthy aspects, though, happens right at the start of each game. The opening sequences of these games are engineered to get your adrenaline pumping and introduce you to the harsh environments that await you. But how does the beginning of the recently released Far Cry 5 stack up to its predecessors? I should note I haven’t actually played all of the Far Cry games. I didn’t have the appropriate hardware to play the first two when they came out, and Far Cry: Primal seemed too boring and derivative to interest me. So, here I will be comparing the introductory sequences of Far Cry 3, 4, and 5. Far Cry: Blood Dragon doesn’t seem like a fair comparison, though I will say that the opening for that game belongs in its own category of awesome. Far Cry 3 starts out with an insufferable montage of rich 20-somethings on vacation. You are introduced to each character as the group engages in typical activities for those of their ilk: drinking, partying, and generally doing their best to be obnoxious in a foreign environment (make any comparisons to popular YouTube personalities that you feel are necessary). The whole thing is set to upbeat music, and generally conveys a pleasant, carefree tone. As you watch the group skydive, the camera zooms out to reveal that you are watching a recording on a phone. The music darkens dramatically as Vaas, the man holding the phone, is revealed. Jason, the protagonist, is forced to watch Vaas taunt him from inside a cage, and you realize the disturbing and horrific circumstances in which the characters find themselves. Immediately there is a jarring impact from the contrasting tones. The transition from the cheerful video to the harsh darkness of reality puts you on edge before you can even follow what Vaas is saying. Once you do listen to his insane ramblings, you realize (just as Jason does) exactly what kind of horrors await you if you don’t take action. Needless to say, it’s an opening that keeps you on the edge of your seat. It remains exciting and unpredictable right up until the title card, but more importantly gives the player a substantial amount of agency. You control Jason as he traverses the terrifying compound, kills a human being for the first time, and sprints for his life through an unfamiliar jungle. This not only makes the opening that much more intense, but also forges a strong connection between Jason and the player. Jason isn’t some guy whose perspective you happen to inhabit. You are Jason, and his struggles are your own. This is something the game repeatedly establishes past its introduction, but its opening does an excellent job accomplishing that connection right from the start. So if Far Cry 3’s opening was that exhilarating, how could the next numbered entry in the franchise possible compare? The short answer is that it doesn’t. While Far Cry 4’s opening isn’t explicitly bad, it fails to show an understanding of what made the introductory moments of its predecessor so engaging. This game starts out with some extremely lazy exposition informing you that the protagonist, Ajay Ghale, was asked by his mother to bring her ashes to ‘Lakshmana’, and that he had trouble getting into her home country (called Kurat) due to some civil unrest. This information could have been conveyed through a clever use of visuals and dialogue, but instead the game chooses to tell you outright. So immediately the mood is harmed by the information dump, but it’s resurrected somewhat when Ajay’s bus into Kurat is attacked at a security checkpoint. Here you are introduced to the main villain, Pagan Min. Like Vaas this guy is extremely fun to watch, but he doesn’t instill the same degree of fear and unease that Vaas did. Sure, he kills a couple of his own men and stabs Ajay’s coyote, but he mostly just comes across as likable. That almost sounds like a good thing, but the affable, friendly villain exacerbates the real problem with this opening. How could you possibly be afraid of this guy? See, the developers thought it would be clever to include a little Easter egg in Far Cry 4’s opening moments. Once Pagan’s goons drag Ajay’s coyote away after he attempts to text his comrades for help, Pagan leaves the room to make a call. He asks Ajay to stay put and enjoy the meal that was prepared specifically for him. Up until this point Pagan has (mostly) treated Ajay with nothing but respect. It’s obvious he knew Ajay’s mother, and that he has a substantial amount of power in Kurat. Given this, and the well-established fact that Pagan will act rashly if he gets angry, Ajay has no reason to leave the table. In fact, if he doesn’t, Pagan returns and takes Ajay and his mother’s urn to Lakshmana. The credits roll, and the game is over. Like, actually over. What. This cute little joke highlights the opening’s biggest problem. If Ajay gets up and investigates the muffled screaming he hears, the intro starts to capture some of the excitement that Far Cry 3 started with. Ajay discovers the coyote in the process of being tortured and is immediately ushered away by a resistance group called the Golden Path. They hand him a gun, and you are free to kill Pagan’s goons in a thrilling vehicular escape from the palace. The problem is, the game already obliterated the connection that made Far Cry 3’s opening so powerful. The only reason Ajay moves from his seat is that he is being controlled by someone playing a video game. In fact, this feels like the reason behind most of Ajay’s actions. Why does he immediately trust the Golden Path? Why is he so willing to kill as soon as he is handed a gun? Why would he abandon what appeared to be his best chance at finding Lakshmana, the sole reason for his journey to Kurat? Because he is controlled by the player, and the player does not want to sit around in a palace all day. The opening on the whole isn’t terrible. It features interesting characters and exciting sequences, but it does so at the cost of your emotional connection with the protagonist. So by this point we’ve had an incredible opening from Far Cry 3, and an acceptable but misguided opening from Far Cry 4. Where does the newest entry in the series fit in? Well, I’d say it’s somewhere in the middle. Far Cry 5 starts out with a documentary-like interview with several of its characters. Like Far Cry 4 the first dialogue you hear is expository, but it’s executed much more creatively. 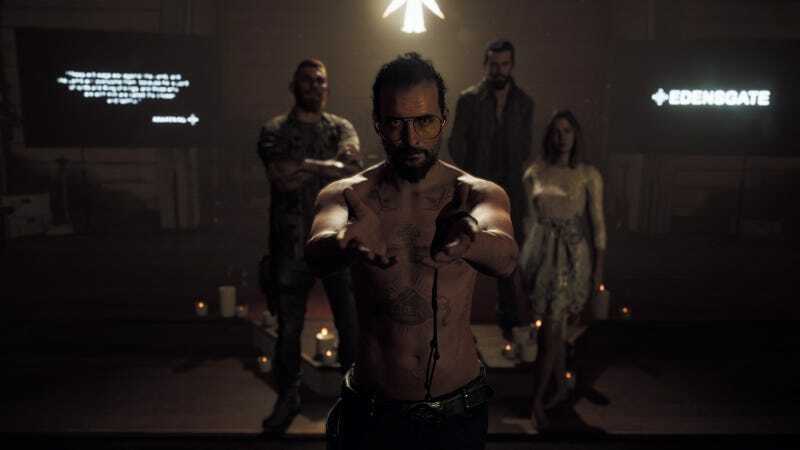 Various characters explain to the camera that Hope County, Montana has been taken over by a religious cult headed by a man named Joseph Seed. Their delivery is confident, but there is clearly a hint of concern in their voices. As a nice little nod to Far Cry 3, the protagonist (irritatingly silent and nameless in this installment) loses signal on the phone with which they had been watching the documentary. The protagonist’s view pans away from the phone to reveal the dark interior of a helicopter flying at night. A hotheaded US marshal argues with an older, more cautious sheriff about their upcoming arrest of Joseph Seed. The marshal pays the sheriff’s warnings little heed as the helicopter lands near a church. The marshal bursts into the church and has the protagonist (or “the deputy”) put Joseph Seed in handcuffs, whose response is simply: “God won’t let you take me.” Joseph is soon proven right, at least in his eyes, as his followers clamber onto the sides of the helicopter, forcing it to crash. The title card fades in over Joseph’s chilling rendition of “Amazing Grace”, the protagonist frees himself (or herself) from the straps of the helicopter seat, and the extended tutorial sequence begins. Now, it may well be unfair of me to consider the title card the end of Far Cry 5’s opening. The title card signaled the end of the introduction in Far Cry 3, but it came well before Ajay’s escape from Pagan’s palace in Far Cry 4. If I included that sequence as part of 4’s opening, why not include the opening gameplay of 5? First of all, it’s my article. I’ll do as I damn well please. Second, and less unreasonably, 5’s opening cutscene is much longer than those of its predecessors. It also attempts to have some semblance of ‘gameplay,’ as some minimal player input is required to progress. This feels cheap, especially compared to the thrills of 3 and 4. You control the deputy as they cuff Joseph Seed, and as they walk him to the helicopter. This does add a little to the haunting image of Joseph’s followers ravenously shouting at the deputy, but overall the player input feels like a shoehorned way to fulfill an obligation. A way to insert gameplay in an otherwise uninterrupted cutscene. All it ends up doing, however, is making it clear that even the developers thought the cutscene was going on too long (and adds another opportunity for a dumb Easter egg ending that I don’t feel the need to discuss). I could also do without the annoyingly obvious objective reminder in the top left of the screen. Even with the disappointment of the lack of actual gameplay though, this opening manages to be extremely powerful and an excellent introduction to the game’s world. The moonlit setting creates a creepy glow on the faces of the brainwashed cultists and contributes to the eerie mood. The character’s motivations are simple and believable, making the writing leaps and bounds better than that of Far Cry 4. And even without engaging gameplay to accompany it, there is a very real sense of tension and dread as the deputy traverses the cult’s compound. The newest Far Cry game nails the emotions that make a great opening without sacrificing consistent tone or character motivations. And in the end, that’s all you really need. Far Cry 5’s opening might not have had the flawless execution of Far Cry 3, but its consistency puts it well ahead of Far Cry 4. The foreboding atmosphere, ominous dialogue, and exciting turns make up an excellent introduction to a very entertaining game. It may not be one for the history books, but Far Cry 5’s opening keeps the series tradition of thrilling, high octane introductions alive and well.